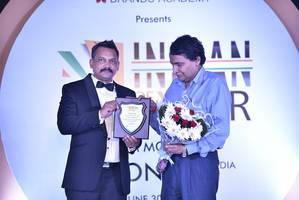 *Railway Minister Suresh Prabhu with SK Sahu, Director of Brands Academy at Indian of the Year award**Brands Academy*, one of the reputed branding companies in India, has recently organized a star-studded mega event “Indian of the Year. The main motive of this event was to recognize the achievements of deserving personalities that have contributed towards building reputation of the country. * This prestigious event was also a celebration as it was 75^th successful event executed by Brands Academy. *In addition to this, some of the leading companies from corporate sector were also honored for their excellent performance in their individual sectors. The winners of *Indian of the Year *awards have contributed towards the growth and development of the nation in different ways. This magnificent event also focused on celebrating PM Modi’s Vision - New India 2022. The event was graced by *honorable Railway Minister Mr. Suresh Prabhu. The main motive of organizing this ceremony was to put limelight on the outstanding contribution of government and private sector organizations and personnel across various Industry Sectors, Social Work, Medicine, Media, Entertainment, Science & Technology in India.